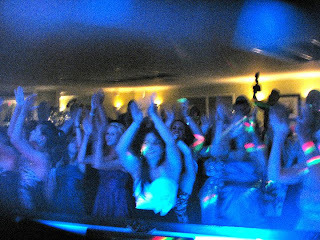 During 2010, I was privileged to touch the turntables 135 times, entertaining guests throughout New Jersey, as well as in Pennsylvania, Manhattan and even Massachusetts. Selecting the ten best parties is no easy task. What ingredients make a top ten party? Exotic locations, interesting clients, electrified party vibes and/or hyped-up dancing crowds tend to be the most distinguishing factors. Below is 2010's top ten list, along with explanations about what made them extra special! They are listed in no particular order. 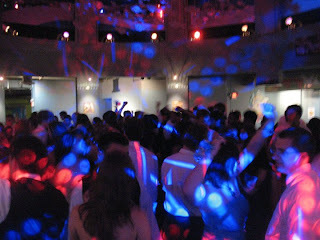 1) West Windsor-Plainsboro Prom - Camden Aquarium. As a former participant in the corporate world, I am no stranger to swimming with the sharks. 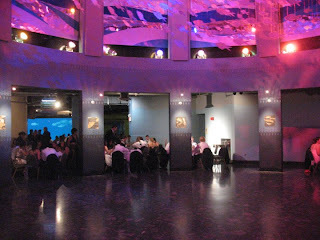 This high school prom was held at the acclaimed Camden Aquarium in a dimly lit area with guest tables situated adjacent to a massive illuminated tank containing sharks, giant rays and other exotic aquamarine life. The DJ booth was situated in a giant atrium, and the students had a blast dancing to a mix of hip hop and high-energy dance music. 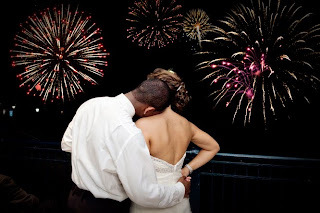 2) Fourth of July Wedding, Sabir & Marina, Columbia Station, Phoenixville, PA. Sabir and Marina are a super cool couple who opted to get married on the Fourth of July, which fell on a Sunday. A bi-cultural crowd of guests embraced all musical styles, and the dance floor was frenzied at times, particularly during old skool and salsa sets. Special touches included a local fireworks display, and a sparkler exit. A detailed blog entry of the celebration can be found here. (photographs above sourced from Wren and Field Photography's blog). 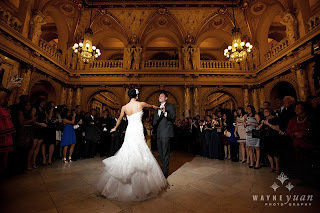 3) Wedding, Eric & Ji-May, Elkins Estate - Elkins Park, PA. 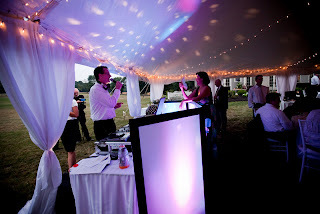 Myself and DJ Brian (aka DJ Extreme) provided the music and entertainment for another awesome couple, Eric and Ji-May. The Elkins Estate is the mack daddy of mansions, built on a grand, majestic scale. 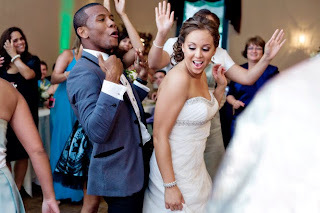 Memorable touches for this November "foodcentric" wedding included a breakdancing exhibition, a food-eating contest, and the groom reading his welcome speech from an i-Pad. A detailed blog entry of the celebration can be found here. 4) Corporate Gala - Bloomberg, Skillman, NJ. Each year, Bloomberg throws an employee appreciation/awards event for its Skillman campus employees. This year's theme was beach & boardwalk (following 2009's Brazilian Rainforest theme). Ambient DJ provided music in three separate zones, with DJ Spinz entertaining guest indoors, while I worked the main stage under a tent. Egils Matisse and his team from Eggsotic Events in Hampton, NJ once again transformed the campus into a magical environment with their special lighting and custom-fabricated decor. 5) Alpha I NYC - Midtown Manhattan. In 2010, through a mutual friend, I met Manhattan-based Emm Pakdee, aka DJ Emm Bangkok. Kindred spirits, Emm and I collaborated on a party series at the Alpha sushi lounges in midtown (Alpha I) and Chelsea (Alpha 2). The most successful of these parties fell on Thursday December 16th, when I spun from 11 PM to 3 AM to a group of smartly-dressed party people. The vibe of the party was off-the-charts, and I was definitely locked in a groove on the mixing board that night, playing the music that I love. These are the parties that we live for as DJs! 6) The Lohmann Weddings - Chesterfield, NJ. Holly and Julie are twin sisters. 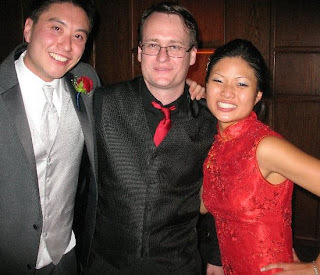 Both were married in 2010, and I had the privilege of DJ'ing both receptions. 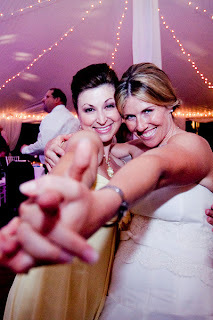 Holly was married in April at the Olde Yorke Country Club in Chesterfield, while Julie was married in September at the Inn at Fernbrook Farms - also in Chesterfield. Mr. Lohmann, their father, is a music lover and attended the planning meetings for both of his daughters, casting his votes for songs to play (and to avoid!). The Lohmanns are good people, and I enjoyed getting to know the family over a period of months. To read the full story (as well as details regarding my other set of "twins wedding" in 2010, click here). (Above - Holly toasts her twin sister Julie at The Inn @ Fernbrook Farms). 8) Farm Wedding, Robin & Matt - Ringoes, NJ. Robin and Matt planned their reception at the Steenman Farm from out-of-state (Florida and Texas). Despite the logistical challenges, a program with many details and heartfelt moments came off seamlessly. To my delight and somewhat to my surprise (it was very hot and humid under the tent), the dance floor sprung to life later in the evening and an hour of overtime was commissioned. Memorable touches included announcing a guest to the theme from Top Gun, and a glowing note of appreciation received from the bride. 9) Waterfront Wedding, Pat & Drew - Brick, NJ. Patrice and Andrew opted for an intimate party with a smaller group of family and friends (many from New York). This extended reception featured a loose structure, and rigid formalities were replaced by ample cocktails, cigars and lobsters! I shared the entertainment card with duo "Chelsea and Ronnie." Chelsea is an amazing lounge-style singer, while Ronnie is the smoothest sax player that you will ever meet. What struck me about this reception was the mentality of the guests (particularly Patrice) who possessed a zest for life and genuinely cared about the people around them. It was a great feeling when Ronnie offered to prepare me a plate of food (I was entertaining at the time) before he had even eaten himself! The detailed blog entry of this event can be found here. 10) Corporate Party Series, Dow Jones, Plainsboro, NJ. This past June, I booked a Monday evening party for a sales group from Dow Jones, who was training at the Wyndham Conference Center. Our first evening of trivia and karaoke was such a success that they had me return two nights later for the group's final night in town. These super outgoing individuals really made the party pop! We start 2011 with a blank slate. Will your next party make a future Top 10 list? Thank you for reading the Ambient DJ blog, and best wishes for a happy, healthy and prosperous New Year! We are honored to have made the top 10 list especially at number 2. You kept the dance floor packed and you definitely know how to work a crowd. You really helped to make our night even more special. We wish you much success in 2011.